Through communication with our valued customers and work with our experienced Research and Development team, we have developed many innovative and unique products for the industry that allow for greater ease and efficiency. 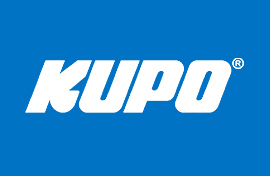 All KUPO grip products have been designed and manufactured under strict quality control for long lasting durability in harsh production environments and to meet internal safety regulations. Our products, including our electrical accessories, and popular Convi clamps, couples, safety wires, and wind-up stands, have been certified by the TUV-GS, CE, UL, and CUL. We appreciate your constant encouragement and input that pushes us to strive for better service and products that meet your requirements.